Data Explorer now has a compare option for Previous year (same weekday), which previously was only available in Dashboards. 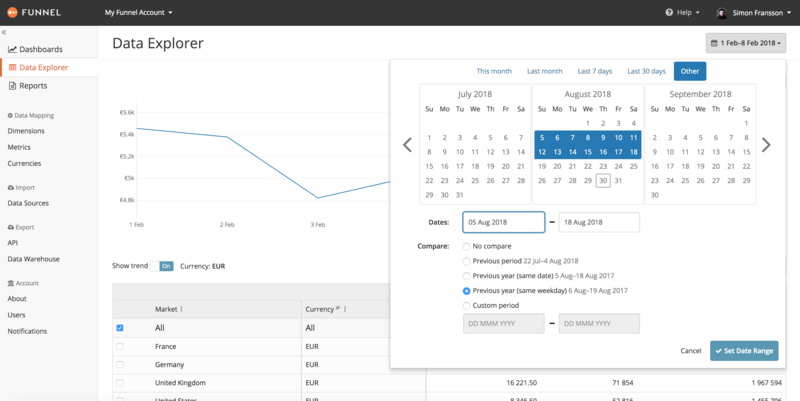 This let's you compare your selected date range to the same period last year – not by comparing explicit date, but rather by a period matching the same weekdays during last year's period. For example, if you would compare Monday 1st through Sunday 7th of January, 2018 with the same period last year using the Previous year (same weekday) option, you'd be comparing to 2nd through 8th January of 2017, as in 2017 the first Monday was on the 2nd. Due to this change the option previously available in the Data Explorer has been renamed from Previous year to Previous year (same date).